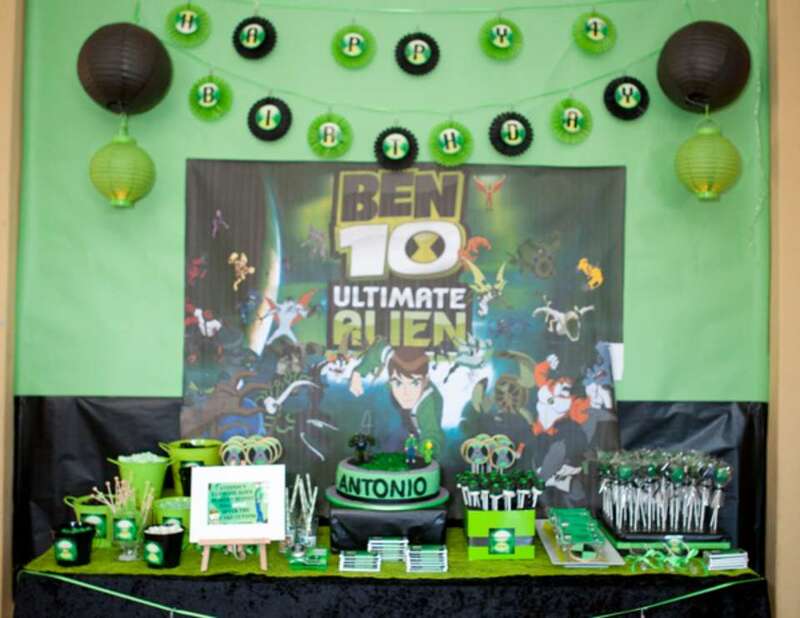 Antonio was very determined that he wanted a Ben 10 Ultimate Alien party and a dress up party for his 4th Birthday. I knew from the start that I was going to do some type of Dessert table with a small candy bar. The cake was a white chocolate mud cake with green swirls in it. I only came up with the idea of decorating it at 2am the morning of the party with the help from my husband! Crazy!! I was pretty organised with everything else including, personalised chocolate bars,Cake pops, onmitrix cookies in bags and on a stick, Green jelly cups, green cordial and Chocolate milk bottles. My friends made the Marshmallow sticks, Cupcakes and green pops corn cups. I was really happy with my favour bags but so upset I didn't get a photo of one of them. Each kid had a black box with an individual sticker with their name on it. 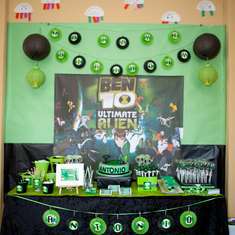 The boys had a Ben 10 note book,ben 10 pen, Omnitrix watch-with lollies in it , personalised chocolate, punching balloon, Ben 10 figurine, bouncy ball, ben ten stickers and tattoos, The girls had the same but with Ticker bell instead. We had a visit from Spiderman who was fantastic and keept the kids entertained for the full hour and half. I organised a Photo booth with crazy dress ups, crazy hair spray and tattoos that the kids enjoyed. I also did all the party printable's, just in photoshop. Overall Antonio and his friends had such a great time that all the hard work and late nights were well worth it! 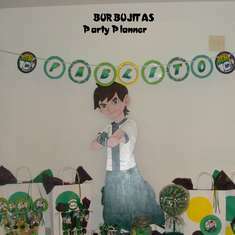 Thanks so much for posting pictures of your Ben 10 party! It looked amazing!!! My son is having his party tomorrow and I took so many inspirations from your pictures (especially the dessert table!!!). 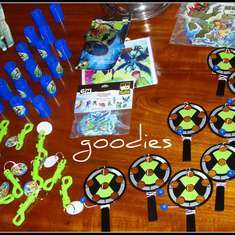 I wish Ben 10 was more popular here in the States because finding toys for the favor bags and actual licensed supplies (plates, napkins, cups) is impossible to find). Great to hear you able to use some of those images to gain inspiration! I love looking at this site for that reason! You will have to post some pics of the party, Good luck and I hope he has a fantastic day! 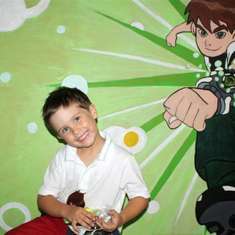 As for all the ben 10 supplies, I bought most of it from the states! birthdaydirect.com I have used them for the past 2 years and they are fantastic. I bought all my daughters 1st mini mouse them ( and alot of it), thomas, ben 10 and now just placed an order for Dora. They dont ship to Australia so i use a freight forward company and it is still so much cheaper than buying it here in Australia. ie mini mouse large foil balloon is around $30.00AUS (without gas) here and in the states it $13.00, paper plates $11.95AUS to $2.20US I did most of the personalised printable myself and all some of the party favour i purchased from Kmart which is your Walmart equivalent and they were pretty cheap too.